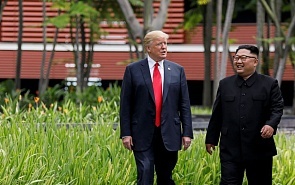 On February 27-28, 2019, Vietnam will host a second summit between North Korean leader Kim Jong-un and US President Donald Trump. Trump has announced this in his State of the Union speech. In order to yield tanglible results, the meeting must be different from last year’s summit. The Kim-Trump conversation in Singapore helped to diffuse tensions on the Korean Peninsula. North Korea has refrained from holding underground nuclear tests for more than a year. It also has not launched intercontinental ballistic missiles. Moreover, it invited monitors to watch how it would blow up its rocket engine and nuclear test sites. In response, the United States suspended tension-provoking US-South Korean military exercises. At this, the first summit’s positive effect was exhausted. The encouraging agreement on the “denuclearization of the Korean Peninsula” remains a declaration of good intentions. The parties have a different vision of how to reach this goal. The US is urging North Korea to take the first step by carrying out full nuclear disarmament along with scrapping its missile potential. It is only after this that the US will be ready to reward Pyongyang by lifting sanctions, issuing a declaration to terminate the state of war between them, and establishing diplomatic relations. The US is pressing for an “irreversible” disarmament but is not prepared to secure an “irreversible” agreement. Its withdrawal from the JCPOA and the INF Treaty is a signal to foreign partners that they cannot rely on Washington’s promises while engaging in vital national security decision-making. It is possible that the next US president, perhaps a Democrat, will soon expose Trump’s “gross dereliction of duty” in foreign policy and scrap the deal with Pyongyang. Moreover, Trump himself has repeatedly shown a knack for revising his own decisions. If by that time the DPRK makes enough “irreversible steps,” it will find itself in an unenviable position militarily and politically. The maximalist strategy of swapping American words for North Korean actions does not (and will not) work, as the United States is beginning to acknowledge. Speaking at Stanford in late January, US Special Representative for North Korea Policy Stephen Biegun made a remarkable comment when asked whether the United States was going to leave the sanctions in place until North Korea’s complete denuclearization: “We didn’t say we won’t do anything until you do everything.” But he also admitted that a “perfect outcome moment where the last nuclear weapon leaves North Korea, the sanctions are lifted, the flag goes up in the embassy and the treaty is signed in the same hour” was improbable. If all of this fails to occur on the same day, the parties will have to move towards the goal step by step for a long time and trade equal concessions along the way. The US terms for continued negotiations include full data disclosure on North Korea’s nuclear potential and missile programs. Pyongyang is unlikely to release these for fear that upon receiving the strategically sensitive information the US will leave the negotiating table and attempt to solve the problem by means other than diplomatic channels. But the prospect of North Korea destroying all of its nuclear enrichment capacities appears quite real. Kim Jong-un seems to have said as much to Secretary of State Pompeo in October 2018, when he was visiting North Korea. In this case, the first stage of denuclearization will see North Korea no longer capable of manufacturing new nuclear devices, but it will keep whatever it had until then. US experts invariably warn that North Korea will conceal part of its nuclear arsenal from verification. Given the current level of trust between Pyongyang and Washington, this does not seem surprising. But if the parties manage to come to terms on dismantling the production facilities, it will not be of importance, at this stage, how many dozen nuclear devices Kim Jong-un has and where they are hidden. The important thing is that they should not multiply. The question is what positive steps Washington is ready to take in response to the closure of nuclear facilities. Pyongyang must understand what it will get in exchange. There must also be certainty that these benefits will not be declared null and void by the anti-Trump Congress or the next president. The summit in Singapore demonstrated once again that North Korean diplomats know their work brilliantly, although that was clear before. They sharpened their skills on the Chinese, South Koreans, Japanese, Americans, and – perhaps first of all – on Russians, who have been successfully manipulated for decades. Yet another card that North Korea could play in the foreseeable future in exchange for real US reciprocity is taking out of the country the available intercontinental ballistic missiles. In this case, the North Korean nuclear weapons will no longer be a threat to the US mainland, although North Korea will still be able to deliver nuclear strikes against US military bases in neighboring countries. At the upcoming second summit, the US president will be able to use his bargaining talents to hammer out an agreement on concrete steps toward solving the North Korean nuclear problem based on reciprocal concessions. Who can guarantee the reliability of US security guarantees to the DPRK is still an open question. China is the only candidate for this role. After a protracted period of mutual alienation, Beijing and Pyongyang are demonstrating rapprochement and greater mutual understanding. In late January, North Korea’s 300-member musical group visited China, with its concert attended by President Xi Jinping and his wife as well as key local foreign policy officials like Wang Hongying, Yang Jiechi and Wang Yi. The Chinese leader had a friendly chat with Ri Su-yong, the vice chairman of the 7th Central Committee of the Workers’ Party of Korea and the director of the party’s International Relations Department, who came to Beijing with the performers. In April, Xi Jinping is expected to visit Pyongyang. The PRC and the DPRK are seeking to restore the atmosphere of erstwhile friendship ahead of the upcoming celebrations of the 70th anniversary of their diplomatic relations. The Chinese support makes North Korea certain of success in negotiations with the US. President Trump will have to take this into account.